Father Francis Poux died on September 17, 2012 amidst the prayers of his confreres at the St. John Neumann Residence at Stella Maris, in Timonium, MD. 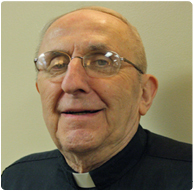 Father Poux was born on November 1, 1933 near Meadville, PA; professed his first vows as a Redemptorist on August 2, 1957; and was ordained on June 17, 1962. After graduating from St. Agatha High School, located near his birthplace of Frenchtown — an unincorporated community in Crawford County, PA — he studied Latin at St. Mary’s College, the Redemptorist Preparatory Seminary in North East, PA. When he finished his novitiate year in Ilchester, MD, he went on to complete his theological studies at Mount St. Alphonsus, the Redemptorist Major Seminary in Esopus, NY where he was ordained. For the first 25 years of his priesthood Fr. Poux’s foreign mission assignments in Brazil included work in Aquidauana and Curitiba, as well as the responsibilities of serving as superior in the Redemptorist communities at Bela Vista, Telemaco Borba, Paranagua and Campo Grande. Two other classmates, Fr. Tom Travers and Fr. John McGowan recall, “He had a great singing voice and anchored the bass section of the choir by himself. We used to tease him about talking too much. But he loved our common life: outdoors and in. He played all sports well — hockey, a fantastic catcher in baseball.” “And in the common room we even played two-handed pinochle,” adds another peer, Fr. Frank O’Rourke. Perhaps his zeal for the people and his love for the Congregation of the Most Holy Redeemer is best summarized in Fr. Poux’s own words which he wrote on July 31, 1957 at the age of 23: “I used to go over and over the Maryknoll Magazines and enjoyed just looking at the pictures of the young priests, how happy they all seemed! Was I to be a Maryknoll? “My question was answered in the form of a Mission given by a Redemptorist. I had seen these Fathers before: 40 hours, helping out on Sundays, etc. But all of a sudden this priest who gave such down-to-earth sermons, who stood at the altar rail in a long black cassock with the big rosary hanging from his wide cincture, and who clearly meant every word he said, this priest captured my eye and my heart. May your soul rest in this peace, Fr. Poux. Rest in God’s peace now and forever. Amen.